power will turn upon its wielder. Because of the self-inflicted 40 bleed buildup for each strike, wield as much equipment with bleed resistance as possible (e.g., Bloodshield, Bloodbite Ring). Once the meter is close to filling up, swap weapons or consume a Bloodred Moss Clump. 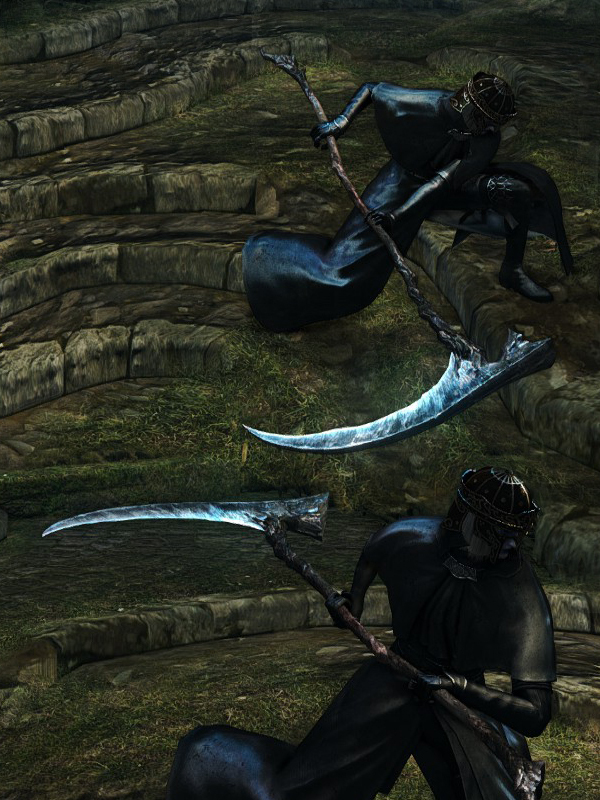 One of the few weapons where the two-handed strong attack does more damage than the two-handed jump attack (forward + strong attack), same as the Great Scythe. R1 Overhead chop. Rather slow for an R1 attack. R2 — R2 Heavy right-to-left horizontal swing into left-to-right horizontal swing. Backstep or Run — R1 Running right-to-left horizontal swing. L2 (left hand) Quick left-to-right horizontal swing. R2 — R2 Running left-to-right horizontal swing into right-to-left horizontal swing. 8% STR, 94% DEX scaling. 1. This means the Halberd weapon class, although you can use the Halberd too.